What do people really want in their homes in the coming year? Are there “must-have” features or a “wish list” to be reviewed at a future time? 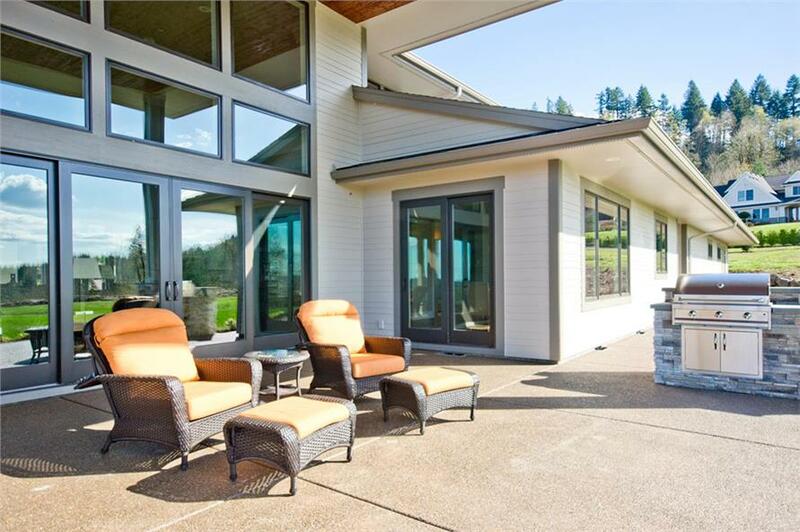 As 2018 looms closer, residential architects, builders, and home designers get ready to face the challenges of providing the features that potential buyers and current homeowners want – and need – in their homes. While interior décor trends shift and change at a faster, more frantic rate, home plan design trends tend to move at a slower, steadier pace. So features and modifications that made sense in previous years – like the open floor plan concept, larger showers in master bathrooms instead of tubs, and outdoor living spaces – are not necessarily passé, with homeowners still looking to include them, along with newer trends, as they build new homes or renovate older residences. The Plan Collection approached several experts who track trends in home design and innovations in the housing industry for their predictions and expectations. Here’s the verdict for 2018. Simple and beautiful lines will always be “in,” no matter the size of the home. And even with the improving economy, homebuyers are leaning toward the comfortable, practical, and functional rather than the showy and ostentatious. 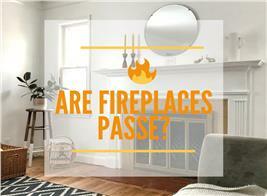 Eco-friendly, energy-efficient, and water-conserving home features continue to be popular. 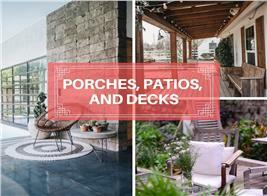 Call it the Joanna Gaines/Fixer Upper effect, but America is enamored with Farmhouse plans, especially the newer, contemporary – or transitional – versions with light-colored vertical siding, metal roofs, and main-floor master suites. While the Farmhouse has stepped into the 21st century, it has maintained its simple, clean lines, and homey feel that everyone loves. Add all the modern amenities, and it’s easy to see why people just can’t resist the updated Farmhouse style. A note for those who may be interested in other sought-after styles: transitional Prairie, Craftsman, Shingle, and Mountain style in Colorado continue to be strong – and watch out for the Mid-Century Modern! 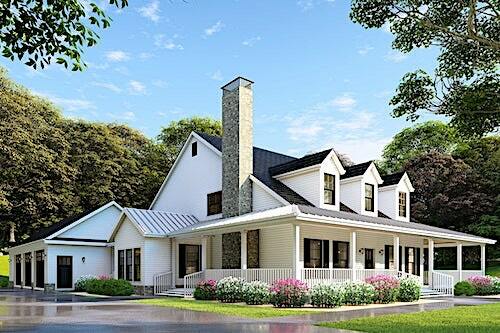 This farmhouse design has been modernized to include an open floor plan with eat-in kitchen, master suite with his and her walk-in closets on the main floor, contemporary chimney, and 3-car garage – along with the signature wraparound porch and a grilling porch on the side between the dining room and the garage (Plan #153-1940). Here’s a gorgeous updated transitional Prairie style home with 4 bedrooms, 3 baths, and wraparound rear porch/deck spread over 4,820 sq. ft. of space (Plan #149-1892). Potential buyers with a penchant for homes with character and history find the simple but well-defined and charming features of the Craftsman aesthetic quite attractive and appealing. 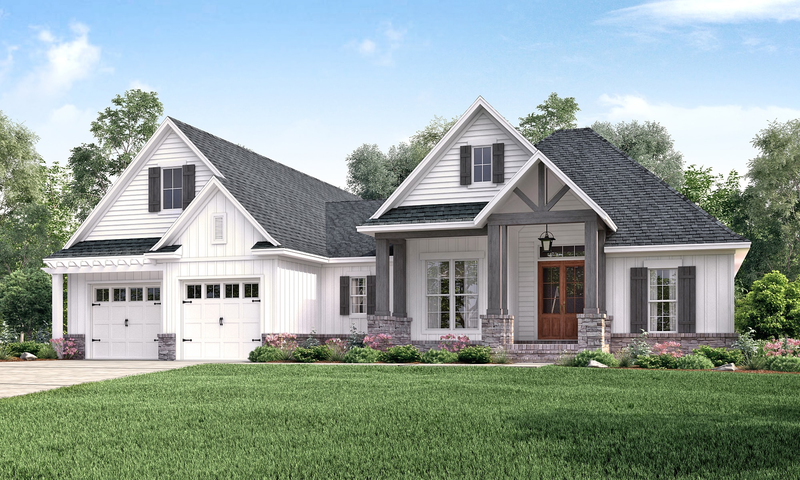 Take a look at the Craftsman touches in this lovely 1-story, 3-bedroom Country home – the exposed gable-end beams, large windows, and columns set on pedestals (Plan #142-1177). Forget about blue and white or black and gray siding combinations paired with darker blue hues. Expect more houses to feature white and light-gray sidings – both warm, neutral colors that highlight the home’s exterior lines. The white and light-gray siding of a 4-bedroom Prairie style home complements the orange/brown/beige color combination of the outdoor patio’s furniture (Plan #149-1892). Add character and visual attractiveness to the Great Room or a simple living room with exposed beams. Not only does a vaulted room create a breezier and bigger feel in a space, it also allows more natural light to filter into the room. For those struggling to visualize an interior, today's house plans with videos and virtual reality walk-throughs can demonstrate the "wow" factor of vaulted ceilings before making such a design commitment. This vaulted Great Room in a 1-story, 4-bedroom Contemporary style home adds to the appeal and charm of the residence (Plan #161-1085). Large Craftsman or Prairie style windows, especially with black sashes and grids, are attractive and decorative, and they bring the outdoors into the interior space. Eye-catching Craftsman-style windows – both large and small – surround this 2-story, 5-bedroom bungalow. One can just imagine the abundant natural light inside the home (Plan #119-1221). 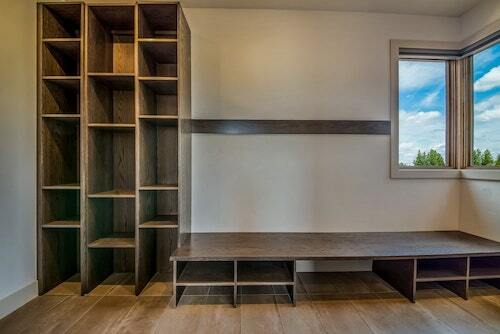 Instead of a general utility space that combines the laundry and mudrooms, families are more interested in a dedicated drop zone/mud hall with cabinets, shelves, sinks, storage, benches, and lockers where they can “dump” backpacks, coats, boots, shoes, sports equipment, and other stuff. This mudroom has a wide bench with lots fo cubbies and shelf area for the family to drop off out clothing and belongings (Plan #202-1025). Computer desks now tend to give way to tech closets and charging stations. With multiple cell phones and other electronic devices in the home, the family needs sufficient room for a charging station. Make sure there are also plenty of outlets around the house to plug in these devices. Think about installing a charging station in the kitchen, entryway, or mudroom so that the entire family can have easy access to it. The so-called wine culture continues to grow in American society, but not everyone (make that very few of us) can have a wine cellar. Wine chillers are hot appliances these days, and more newly built homes come with them in butler's pantries (which are also increasing in popularity) and wet bars than ever before. Can’t afford a wine cellar? Go for a combination butler’s pantry/wet bar and wine refrigerator – and still impress your friends! 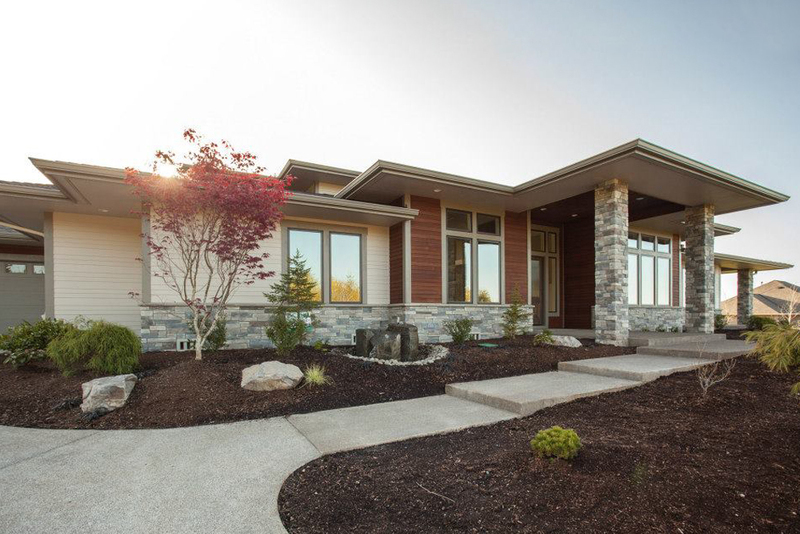 As Craftsman, Arts & Crafts, and other “back to basics” design styles continue a strong foothold in the American home building and design scene, the straight-line aesthetic of these styles will dominate the scene. Think rectilinear openings, quadralateral rather than rounded columns, and other squared-off design features. 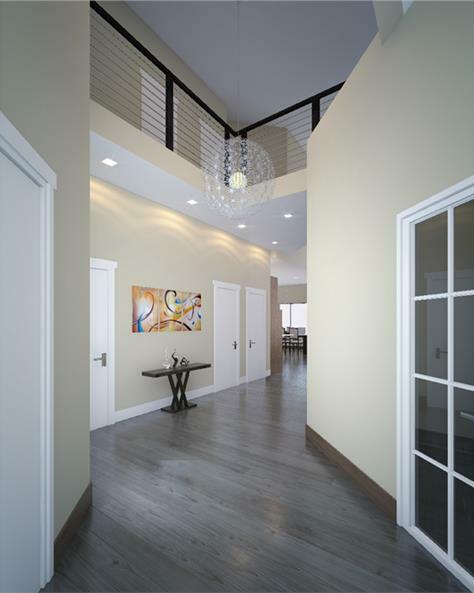 While arches are not totally out of the picture in the coming year, straight and classic lines as in the spacious entry hall of this 2-story, 5-bedroom Modern style home will be seen in more design plans (Plan #149-1894). As the economy improves, house sizes will tend to get bigger, even with the “not-so-big” disclaimer from homebuyers. And bigger homes will feature three-car (and bigger) garages for all those vehicles of a mobile society – and for additional storage space. This amazing 2-story, 5,023-sq.-ft. Shingle-style home with 4 bedrooms and 3 baths features a 3-car garage – a trendy item in 2018 house design (Plan #161-1038). 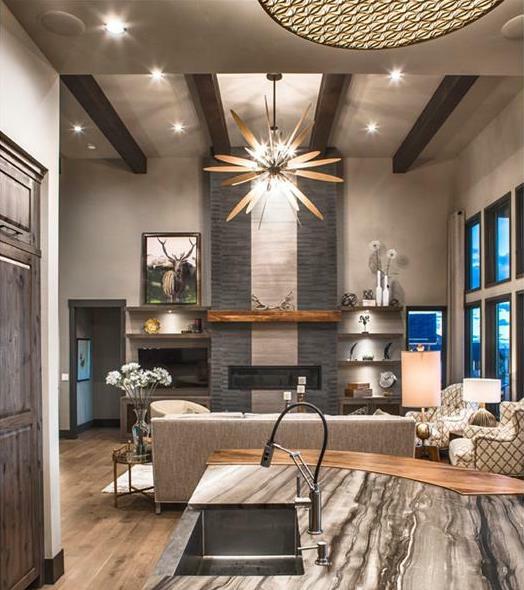 As 2018 unfolds, we can expect more innovations in house plan design trends to come up – all aimed at meeting the “must-haves” of homebuyers and ensuring that these features bring homeowners the best in comfort, practicality, and functionality. 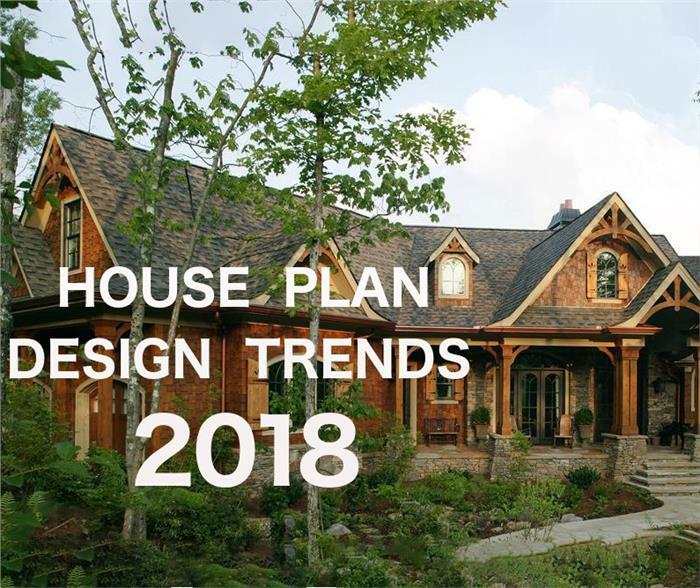 Update: We have published our trends for 2019 in a more recent blog post titled, "Top Trends in House Plan Design for 2019." 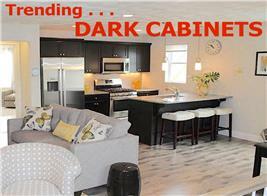 Be sure to check it out to see the latest trends in home plan design. Footnote: The lead image in this article is a 2,611-sq.-ft., 3-bedroom, 2.5-bath transitional Arts & Crafts ranch style home. 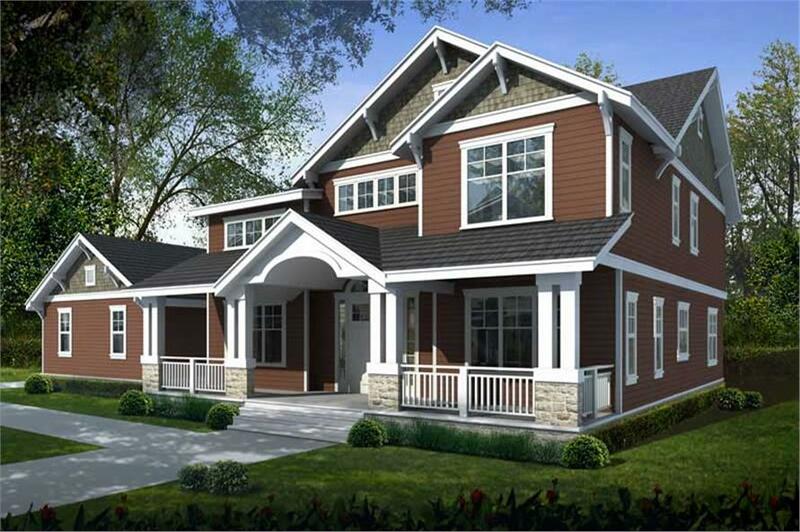 For details, click here (House Plan #198-1010).